@rfeal Francisco Henrique de Oliveira, author-creator of the project “A MESSAGE FOR YOU” is a retired psychologist, specializing in Mental Health, with professional and community activities since the first years of the university that began in 1970. When retiring in mid of 2009, Francisco, known by the popular name of ‘Tito, a psychologist’, chose to dedicate himself to community and voluntary activities geared towards living with children and adolescents in your city. Throughout his work as a psychologist he founded in 1980 the APAE of Boituva-SP (School for Exceptional Children), he also introduced a handicraft technique with liana at ADERE which is an occupational therapy workshop for the disabled and also has as a volunteer foundation a non-governmental entity, INSTRAN-Campinas, which is focused on the prevention of traffic accidents. In 2010, faced with a picture of depression presented by his mother, Tito created the project “A MESSAGE FOR YOU” with the objective of coping with the psychological illness that was installed in that lady. So in December of that year, on the eve of Christmas a small panel with positive messages was installed in front of the house so that Mrs. Edna, her mother, would be distributed to the people as a reminder of the Christmas moments. Initially the panel was installed to meet only pedestrians, but soon that scenario turned into something unexpected. People began to pick up the messages and with spontaneous disclosure the distribution gradually increased and intensely enough to bring about changes to meet the unusual demand. That project, which was only to be an occupational activity for Mrs. Edna, seeking to remove her from depression, ended up translating into an event of proactive impact throughout the community to the point of receiving, as a form of consideration and appreciation, her first award: “Amparo-SP Mother Symbol Award 2011”. This award was offered as public recognition from a judgment of responsibility of the Commercial Association of Amparo. With such awards and the natural dissemination of the project in the local media the distribution of the messages increased significantly and Mrs. Edna’s affective-emotional framework had a profound change. Considering this situation another change was generated that allowed that the drivers of the vehicles, besides the pedestrians, could collect their messages without leaving their cars. In 2012 Tito’s mother, Mrs. Edna passed away. Faced with this fact he then imagined closing the project, but realized an additional motivation it happened. : the population in expectation of continuity and with charges so that there would be no interruption of it. 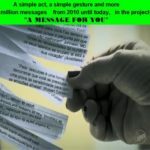 Then the psychologist chose to continue in the same patterns of presentation since the origin of the Project “A MESSAGE TO YOU”. In all these initiatives to date, the participation and management of the psychologist Francisco has been paramount and exclusive, as it is his responsibility to select, prepare, format, collage and other procedures so that the message board is available daily in front of his residence.